This painting was commissioned by the artist Cardinal Scipione Borghese. David and Goliath, relying on biblical information, were heroes of antiquity. David was to be king of the Jews, and Goliath was a gigantic Philistine. In one of the biblical legends tells of the confrontation of these two characters. Goth was the native city of Goliath, and he came from the giants of the Raphaim. During the reign of Saul, this giant terrified the army of Israelis, fighting on the side of the Philistines and differing in incredible strength and cruelty. David was a young shepherd, who became one of the soldiers of the Israeli king. He heard about Goliath, whom even the most courageous soldiers were afraid. But having shown incredible courage and valor, the future king summoned the giant to a duel, which ended in his favor. He struck him with a stone laid in the slingshot. If you believe the ancient information, the growth of Goliath was more than three meters. Many writers mentioned giants who had just such growth. It describes in detail the weapons of the Philistine, who was clad in scaled metal armor and wore a heavy copper helmet. His sword weighed about ten pounds. This type of painting is religious, and exactly repeats one of the biblical tales. 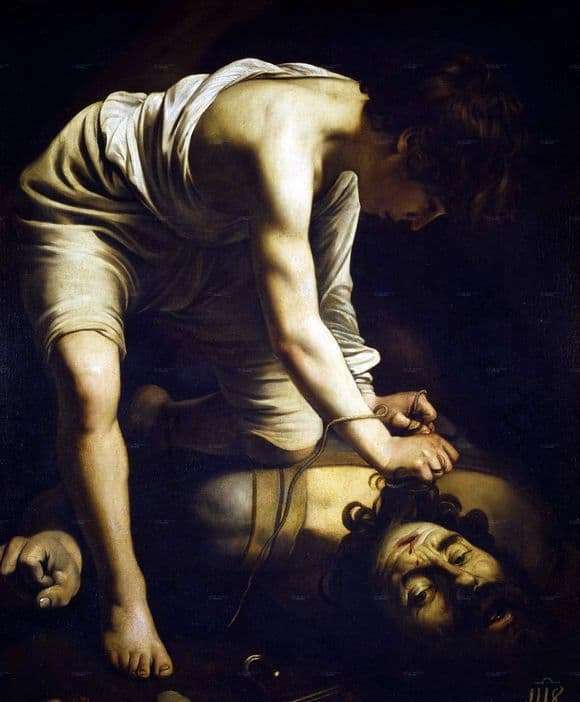 Painting Caravaggio differs sharp contrast of shadows and light, which he carefully worked on the canvas. The images of his characters are idealized, and the plot of the paintings is saturated with allegories. The work of the painter gives a sense of volume, creates emotional tension and emphasizes the simplicity of the characters. The picture seems incredibly soft and agile, differing drama, reflecting the life of the artist. His canvases are plastic and contrasting, causing a strong affectation of feelings.